Love and marriage, love and marriage. They can come with a price you can’t quite manage. We’re in the month of love, when couples start thinking about, you know, marriage. As cliche as it sounds, Valentine’s Day is still one of the most popular days for proposals –– it’s second only to Christmas Day, according to WeddingWire. So, if getting engaged is in your plans this Valentine’s Day — but you and your sweetheart don’t have thousands of dollars sitting in your savings accounts with nothing to do — here’s a brilliant alternative to a diamond ring: a Moissanite Engagement Ring. Wait, moissa-what? Yeah, that’s what I said, too. What Is a Moissanite Engagement Ring? It was a beautiful morning here at The Penny Hoarder headquarters. The sunlight was filtering in through the kitchen windows, casting rays that beautifully reflected off that seriously sparkly thing on senior product manager Brooke Harris’ finger! “This isn’t a diamond,” she told us. She went on to explain the history behind the gem, the cost compared with a diamond ring and just how happy she is that her husband-to-be picked it out for her. Her smile sparkled as brightly as her ring, and we knew we had to tell our fellow Penny Hoarders. About 50,000 years ago, a meteorite crashed into Earth near present-day Winslow, Arizona, leaving a crater more than 2 miles wide and 550 feet deep. That’s where French chemist Dr. Henri Moissan discovered crystals resembling diamonds in 1893. He later determined the crystals were made of silicon carbide. The naturally occurring form of silicon carbide was later named moissanite, in his honor. Because natural moissanite is extremely rare, there were several attempts to re-create it –– none of which were successful until about a century after its discovery. By 1995, the gem finally made its way into the jewelry world when Charles & Colvard saw potential for a new diamond alternative. Charles & Colvard remained the exclusive manufacturer of the gem until its patent expired in 2016, opening the door for other manufacturers to enter the market. Now, moissanite engagement rings continue to gain popularity and are sold in jewelry stores around the globe. 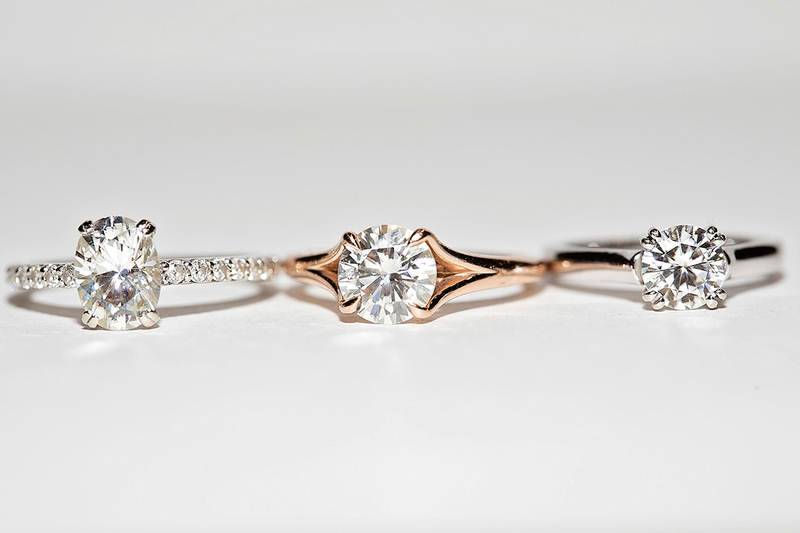 Moissanite vs. Diamond: How Do They Compare? Diamonds are among the hardest natural substances on the planet, measuring a 10 on the Mohs scale of mineral hardness. Moissanite measures a 9.25, not too far from diamonds. 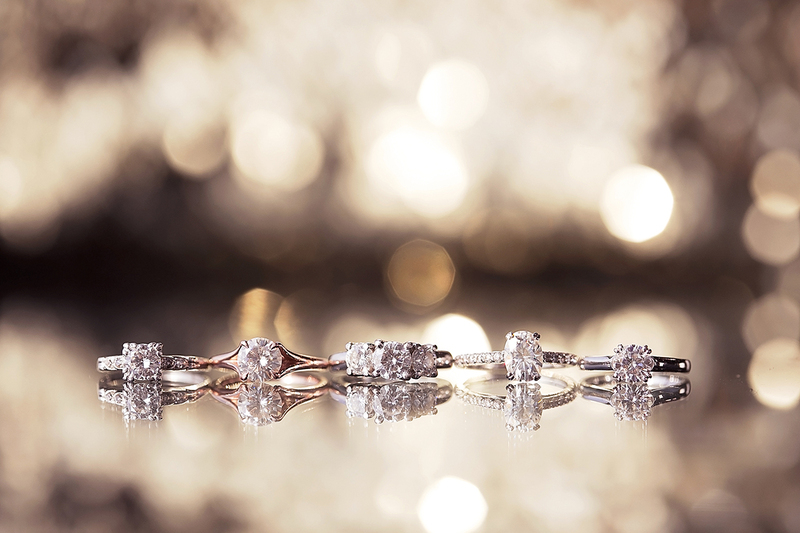 Moissanite engagement ring prices can be as little as 10% of what a diamond engagement ring costs. I compared diamond vs. moissanite engagement ring prices on Overstock.com. This diamond engagement ring is normally priced at $3,344, while this similar moissanite engagement ring is normally priced at $879.99. That’s $2,464.01 (don’t forget the penny) you could save and put toward your wedding or another goal. So just how obvious is the difference between the two to the human eye? While some people can spot the difference, others got it completely wrong when The Today Show compared of the two. Why Choose Moissanite Over Diamond? The biggest advantage of moissanite engagement rings over diamond engagement rings is obviously the price. Couples can put those hundreds or thousands of dollars they save toward something else, like planning the wedding. We all know weddings can be expensive enough. The average cost of a wedding is more than $30,000 –– a Disney wedding costs more than $75,000 –– and that doesn’t even include the engagement ring or the honeymoon. Some couples even opt for wedding loans to tackle these costs. Even wedding guests can end up spending a pretty penny just to be there for the special day. So if you’re already thinking about how to stick to your wedding budget, why not start with the engagement ring? Sure, some may scoff at the idea of buying a lab-produced gem for an engagement ring or feel the need to buy a diamond because of social pressures. But others may find moissanite appealing not just because of the price. Moissanite is created in a lab, so you don’t have to worry about buying a gem that was mined in a conflict zone. That also means moissanite is environmentally friendly. Alexa Vincent, photo coordinator, also loves her moissanite ring. “Five years later and it’s still holding up beautifully,” she said. 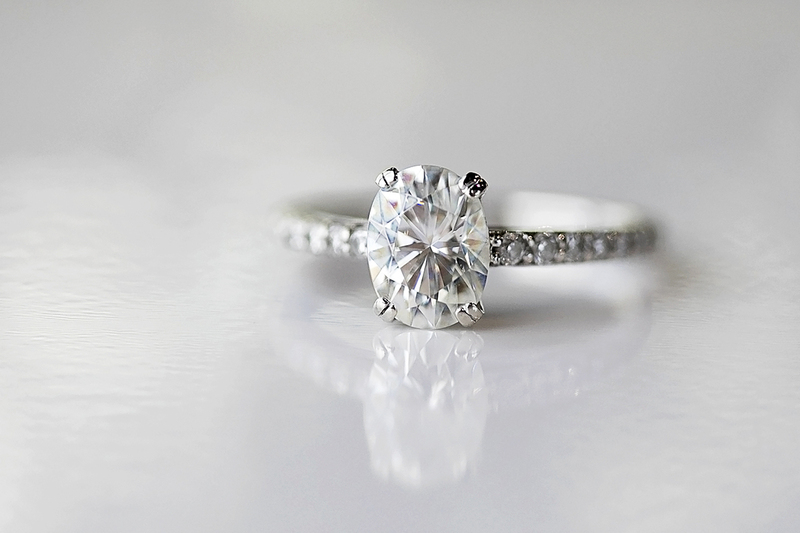 And don’t forget about the romantic appeal of moissanite. Known as the gem from the stars, moissanite has earned nicknames like “Space Diamond” and “Stardust.” Harris’ future husband has a background in astronomy, so he wanted to give the gem of the stars to the woman he loves. If that isn’t romantic, I don’t know what is! Jessica Gray is an editorial assistant at The Penny Hoarder. She’s in love with the idea of wearing a gem from the stars.